Directions: Route 73 turn onto Falls Avenue near (Varsi's Restaurant) continue across Sunnyside Avenue. Senior Center on your left, forest green historical building on Falls Avenue #311. You may e-mail Cathy Unger at cunger@snet.net to have information included in the upcoming newsletters or on the web-site. 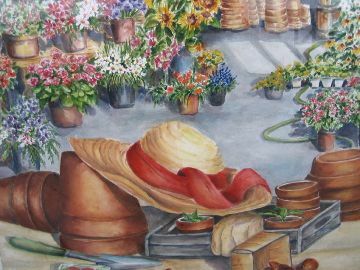 All submissions are subject to approval by Cathy Unger, Editor, and the Board of the Watertown Art league. If you do not have e-mail, to let us know so we can send your newsletter by snail-mail. The Prospect Library is looking for artists who would like to show their work. William Rorick will be teaching a ten-week Potrait Painting Class in his Southbury studio beginning October 4, Tuesday's 9:30 a.m. - 12:30 p.m. For more information please contact him at 203-264-4380 or email williamrorick@aol.com.